Elara Pro is a feature packed food blogging theme designed to give you plenty of ways to share your best recipes, monetize your site, and build a large following of people that love food just as much as you do. It comes with features like built-in promo boxes, Google friendly recipe card functionality, social sharing capability, video post formats, and even MailChimp form support so you can encourage people to subscribe to your newsletter. However, one of the neatest features Elara Pro has going for it is the built-in Recipe Index template. 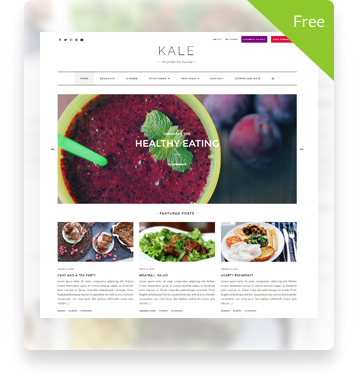 Designed to give you an easy way to display a list of recipes according to category on one single page, the Recipe Index template is the number one way to organize your growing website and improve the user experience. Want to learn how to setup a recipe index in Elara Pro? Keep reading to find out how to do just that, so you can start sharing your most delicious dishes with fellow foodies and continue to grow your brand. The first thing you’ll need to do is create a new page on your website for displaying your recipes. To do this, go to Pages > Add New in the WordPress dashboard. You can then give your recipe page a title, and add some preliminary content, just as you would any other page on your website. In order to access the Recipe Index page template that comes with Elara Pro, you’ll need to go to the Page Attributes box on the right hand side. Then, under the Template dropdown menu, choose Recipe Index. There are two ways to set up your Recipe Index page template. The first involves using the recommended Search & Filter plugin. The second way involves not using the Search & Filter plugin. The free Search & Filter plugin recommended by the creators of Elara Pro is a simple search and filtering plugin that adds an advanced search box to your recipe index page. Allow people to search according to category, tag, custom taxonomy, post type, post date, or any other combination of these. If you decide to remove the search box from your recipe index page, you can still use this plugin to filter your own posts and pages, making it easier to find the content you’re looking for on the backend of your site. 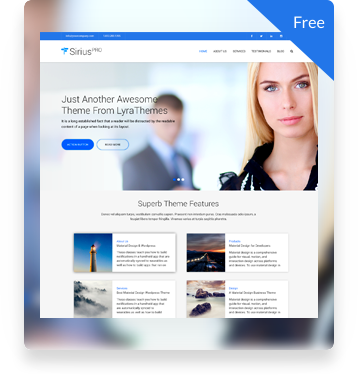 There’s also a Pro version of this plugin that offers plenty of extensive features such as the ability to add meta data to filters, unlimited search forms, easy embedding on all posts and pages using shortcodes, translation support (including WPML compatibility), and eCommerce shop support for WooCommerce, WP eCommerce, and Easy Digital Downloads (EDD). Now we’ll take a look at how to set up your page template both with and without the Search & Filter plugin. If you want to use the free version of the Search & Filter plugin, simply go to Plugins > Add New and search for Search & Filter. Click Install Now and Activate to get the plugin up and running on your website. Once the plugin is activated, and you’ve created your recipe index page and published it, you’ll notice the Recipe Index Options box on the right hand side, complete with Categories to Include and Filters sections. The first section, labeled Recipe Index Options is a way to define which categories you want to display on your recipe index page. Simply click on the categories you want to include on your page. Scrolling down a little more, you’ll notice the other section labeled Filters. This is what makes the Search & Filter plugin so cool. Notice the Categories section displaying for site visitors, complete with how many recipes there are per category. In addition, you’ll see the section for defining a date range. Once a site visitor clicks on their desired categories and/or picks a date range, and clicks on the Filter button, they’ll be taken to the recipes they want to see. This is a great way for people to find exactly what they’re looking for once on your website. You’ll also see that there are social sharing buttons in the footer section, as well as a subscribe box for people to fill out so they can subscribe to your newsletter. 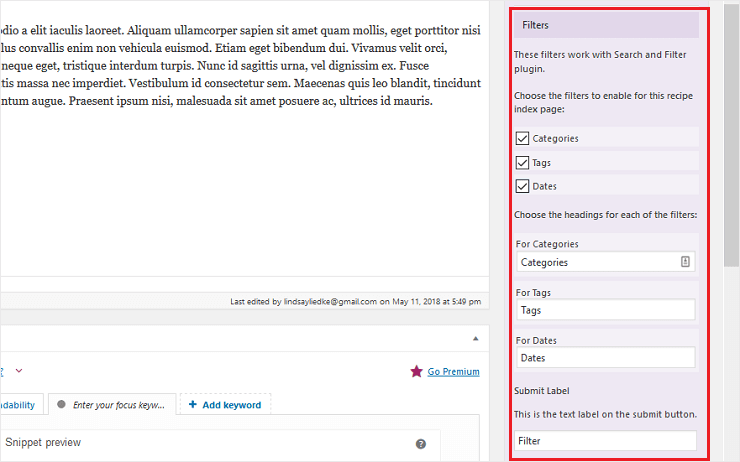 If the Search & Filter plugin is not being used, or is inactivated on your website, once you publish your newly created recipe index page, you’ll notice a new section pop up in the right hand side of the Visual Editor that will let you choose which categories you want to include on you page. This is because Elara Pro has a built-in format that allows you to customize your recipe index page. Just click on the categories you want to include on your recipe index page. 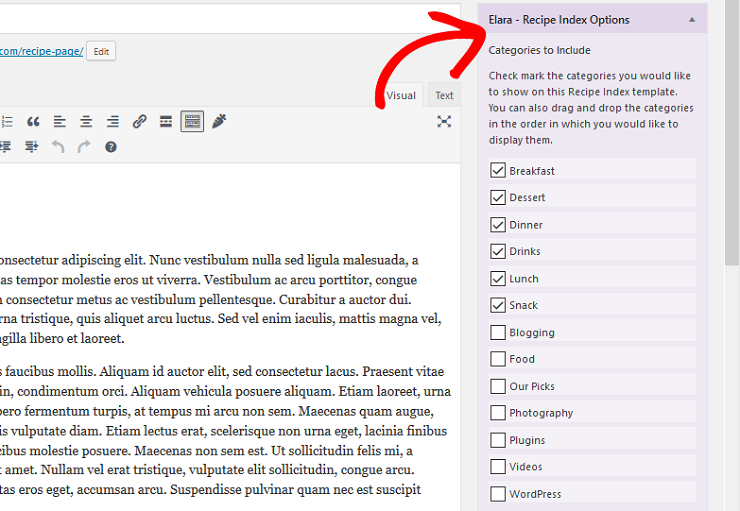 You can also define the number of posts per category at the bottom of the Recipe Index Options section. The default number of blogs per category is set to 4. If you want, you can drag & drop the categories into any order so they appear on your website in the order you want them too. Notice the categories displaying on the left hand side of the page. They are clickable so site visitors can easily navigate to the recipes you have for people to view. You’ll also see that you page’s content appears near the top of the page, which is helpful for explaining the purpose of the recipe index page. In addition, you’ll see featured images of individual recipes that will draw attention to your best dishes and encourage people to engage with your content. 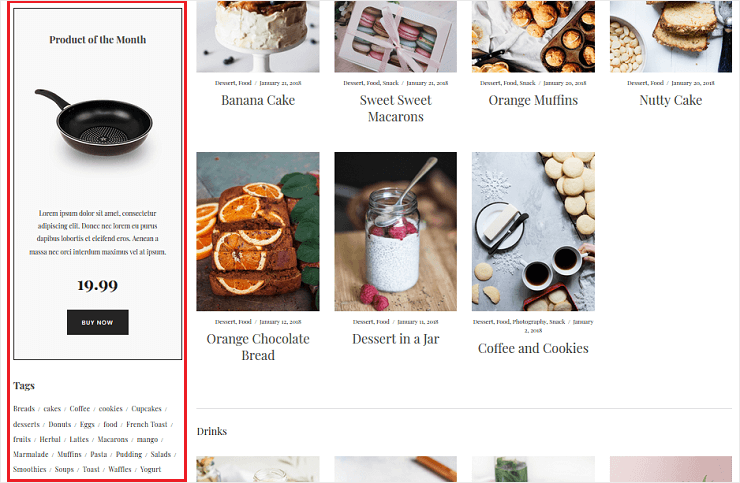 If you continue to scroll down the sample recipe index page, notice how you can add a product link so customers can make purchases from your online shop and tags so those looking for very specific recipes can easily navigate to related content. 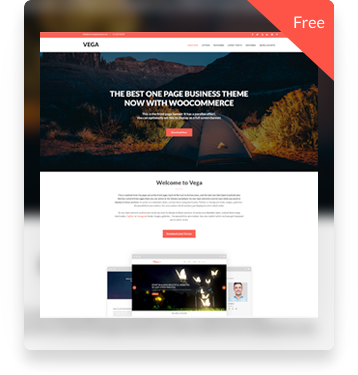 You’ll also see that at the bottom of page that there is a menu for easier site navigation, social share icons, and even a subscribe box so people can subscribe to your newsletter. And there you have it! You now know how to setup a recipe index page in Elara Pro using the built-in Recipe Index page template. If you haven’t set up your food blog using Elara Pro yet, make sure to check our helpful tutorial on how to set up a food blog. You’ll learn all about Elara Pro’s functionality, feature set, and design capabilities so you can make a food blog that beats out all the competition. What do I do if my recipe index only has one category to choose from? How do I add categories or find the other to choose from?